The first thing I taste from the surface of these pieces is a Well-noticed sweetness mixed with a lot of smokiness. I can detect a light bit of heat and saltiness soon after. The chewing brings in a lot of natural meat flavors touched with some garlic and onion seasoning, and a light bit of soy sauce. Meanwhile, the heat picks up a tiny, but is still light. For being marketed as "Spicy", it seems to hold up well. It definitely has a spiciness in terms of a light chile pepper heat, but I can also pick up the spices of garlic and onion, and even touches of black pepper. On my personal heat scale, I'd rank this as medium (level 3 out of 5). It actually starts out with less heat, but after a few pieces, it builds up a little bit more. Otherwise, the flavors that seem to define this jerky is largely the real hickory wood smoke and the natural meat flavors. The sweetness is actually the first thing that hits me, but gives way quickly to the smoky natural meat flavors. Once you get into the chewing, the garlic and onion seasoning comes on in a light amount along with the touch of soy sauce. You don't really taste much of the crushed red pepper, you only get the light-to-moderate heat. 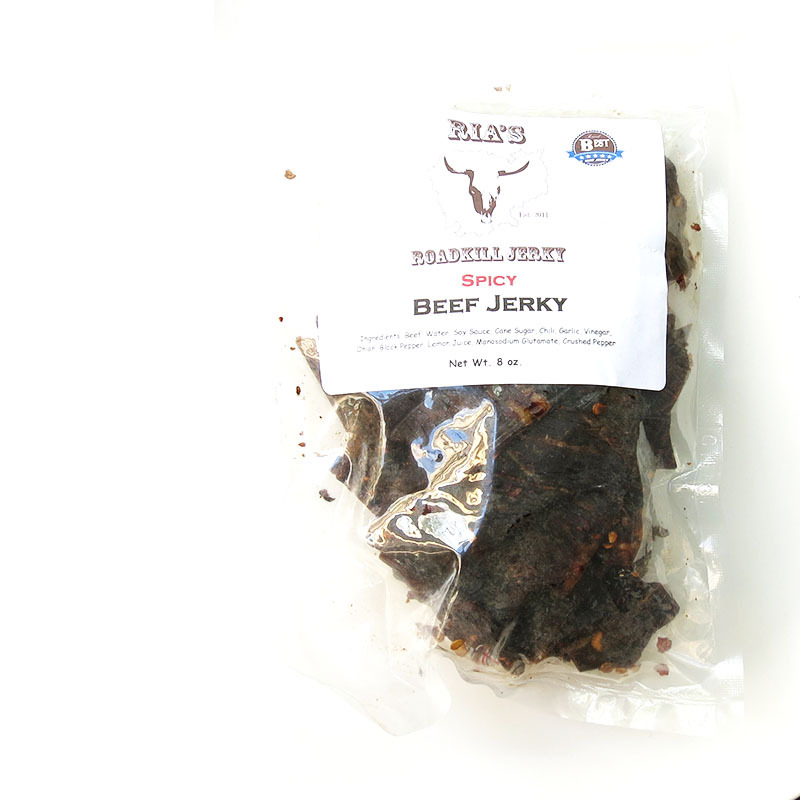 This jerky also gives you a light bit of tangy chewing, perhaps brought on by the vinegar ingredient. Overall, the ingredients combine really well, but still puts the focus on the real wood smoked meat flavor, only adding light amounts of flavor to create something well-rounded in sweet, spicy, salty, and savory, and even a bit of tangy. 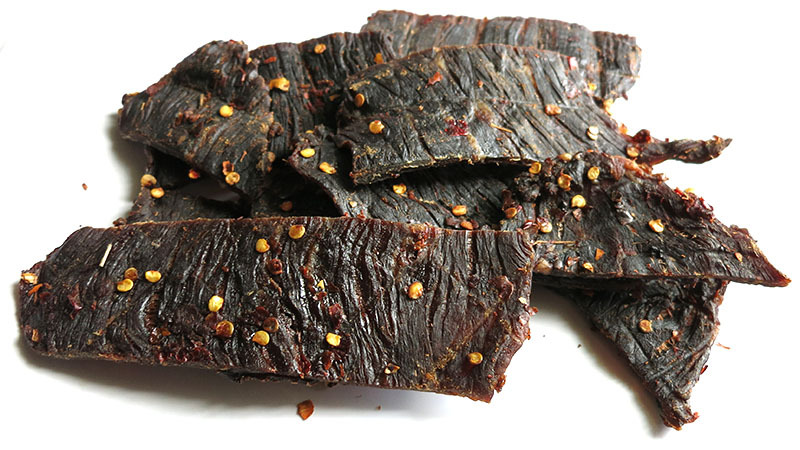 Ria's RoadKill Jerky sells this Korean BBQ beef jerky at a price of $10.00 for an 8oz package. Shipping is flat rate at $6.45. If you bought two 8oz packages, it would work out to a price of $1.65 per ounce. For general jerky snacking purposes, at the $1.65 per ounce price, this is an excellent value. Compared to other brands of jerky sold in stores, this has far better flavor, much better meat consistency, and much better chewing texture. You're basically paying bargain-bin prices for top-quality jerky. As a spicy beef jerky, at the same $1.65 per ounce price, it's an excellent value. I get a moderate level of heat along with light but noticeable blend of garlic, onion, and black pepper spices. Altogether, it generates nice spiciness that's sure to satisfy spicy food lovers, but at a price significantly lower than competing brands. 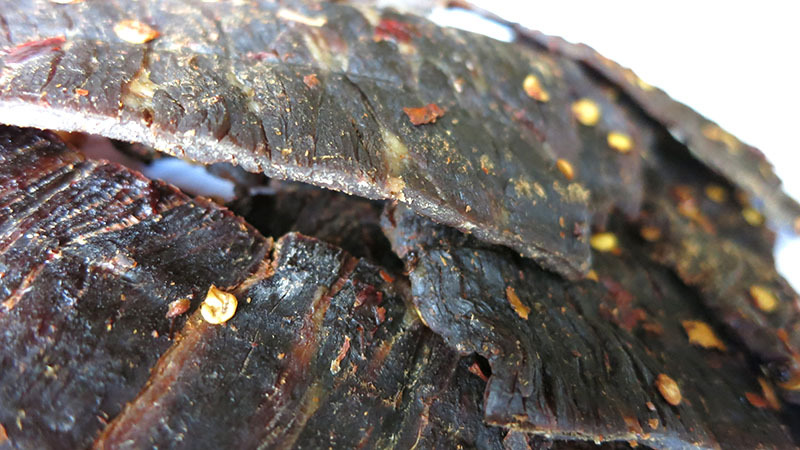 This Spicy beef jerky from Ria's RoadKill Jerky is similar to the Original variety, with a well-defined real hickory wood smoked, natural meat flavor, but builds on top of that with a moderate level of chile pepper heat and a blend of garlic, onion, and black pepper spices, to belt out a satisfying spiciness while preserving the wonder of real wood smoked beef. Overall, it's not hot, and it's not going to scald your taste buds. Yet, if you consider yourself a spicy food wuss, you still may want to avoid this. However, I think the level of heat and spiciness is still perfect for most snackers, while spicy food fanatics will enjoy the bolder flavor against the real wood smoked beef.